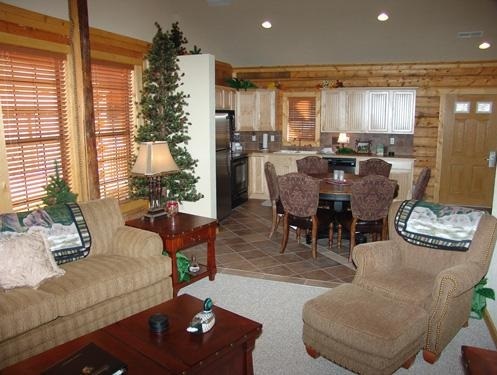 Log cabins in Branson are a great place to spend a warm Christmas Eve with your loved one or with the whole family. Many of the popular log cabins at Thousand Hills Golf Resort are transformed into Branson Christmas Cabins during the holiday season. Many of these cabins are individually decorated to bring out all the feeling of home during Christmas time. If you want to spend a wonderful Christmas with your loved one or with the whole family, you can request one these cabins which are all decorated to make your Christmas vacation in Branson a wonderful one. As Christmas shows in Branson abound during the holiday season, many tourists come to Branson to celebrate the season and enjoy a wonderful Christmas Eve with spectacular shows in many entertainment spots in Branson. Christmas in Branson is a special time for the entire town. Silver Dollar City and other areas in Branson are completely illuminated with light displays during Christmas season, but you don’t realize that when you get back to your cozy log cabin accommodations, you can still continue to celebrate Christmas when you stay at the log cabins at Thousand Hills Golf Resort. Some of the log cabins at Thousand Hills go completely decked out during the holiday season to help you and your family feel right at home. Many of these log cabins have fireplaces to warm you up during the cold nights. There are quite a few of the cabins that are beautifully decorated with Christmas trees. These log cabins in Branson have a fully equipped kitchen that includes modern appliances such as full sized refrigerator with ice maker, a full sized stove, a microwave, a dishwasher, pots and pans, and kitchen ware and utensils. With all these, it will be comfortable for you to cook your own food when you don’t feel going out for dinner. The two-bedroom log cabin at Thousand Hills features a master bedroom and a master bath. The master bedroom features a big king sized bed, a very new special pillow top mattresses, triple sheeting on beds with 320 thread count sheets. The cozy two-bedroom log cabin also has a whirlpool bath, it’s a nice large tub, and everybody would love it. And if you don’t feel like soaking in a tub when you’re in a hurry, you can easily take a nice quick shower. The cozy log cabin that you choose to stay is beautifully decorated for Christmas with little things on the shelves, a Christmas arrangement on the table, and in case you want to do something Christmas-wise on Christmas Eve, you can cook your own food as the kitchen is fully-equipped. With this fully-equipped and decorated log cabin, you can make your stay an unforgettable Christmas experience in Branson. Whether you want to spend Christmas with your loved one or with the whole family, you are sure to find it wonderful to enjoy a warm Christmas Eve in a cozy log cabin in Branson.